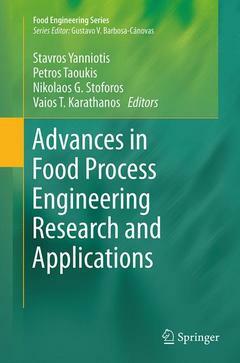 Coordonnateurs : Yanniotis Stavros, Taoukis Petros, Stoforos Nikolaos G., Karathanos Vaios T.
The International Congress on Engineering and Food (ICEF) has been established as the major international event in the field of Food Engineering. The 11th International Congress on Engineering and Food (ICEF11) took place in Athens, May 22-26, 2011 (www.icef11.org). Papers presented in ICEF11 included topics in Food Materials Science, Engineering Properties of Foods, Advances in Food Process Technology, Novel Food Processes, Food Product Engineering & Functional Foods, Food Waste Engineering, Hygienic Design and Operation of Food Plants, Modeling & Control of Food Processes, Food Process Design & Economics, Modeling Food Safety & Quality, and Innovation Management. This book is based on invited contributions to the Congress. Food Process Engineering Research and Innovation in a Fast-Changing World.- Food Process Engineering Research and Innovation in a Fast-Changing World: Paradigms/Case Studies. Part I. Food Materials Science and Food Properties.- Advances in Nanotechnology as Applied to Food Systems.- Relaxations, Glass Transition and Engineering Properties of Food Solids.- Molecular-Based Modeling and Simulation Studies of Water-Water and Water-Macromolecule Interactions in Food and Their Effects in Food Dehydration.- Rheological and Structural Characteristics of Nanometer-scale Food Protein Particle Dispersions and Gels.- Transport Properties in Food Process Design. Part II. Advances in Food Process Technology.- Applying Advances in Food Process Engineering in a Changing World: The Industry Perspective.- Recent Developments in Drying Technologies for Foods.- Batch Coffee Roasting; Roasting Energy Use; Reducing that Use.- Advances and Challenges in Thermal Processing with Flexible Packages.- Current Knowledge in Hygienic Design: Can We Minimize Fouling and Speed Cleaning?.- Encapsulation Systems in the Food Industry.- Aroma Encapsulation in Powder by Spray Drying, Fluid Bed Agglomeration and Coating.- Advancements in Microbial Polysaccharides Research for Frozen Foods and Microencapsulation of Probiotics.- Food Allergens and Processing: A Review of Recent Results. Part III. Novel Food Processes.- Emerging Technologies for Targeted Food Processing.- Nonthermal Technologies to Extend the Shelf Life of Fresh-cut Fruits and Vegetables.- Enhancing Extraction from Solid Foods and Biosuspensions by Electrical Pulsed Energy (Pulsed Energy Field, Ohmic Heating, and High Voltage Electrical Discharge).- Food Structure Engineering for Nutrition, Health, and Wellness.- Transfer of Water and Volatiles at Interfaces: Applications to Complex Food Systems. Part IV. Modeling and Control of Food Processes.- Modeling Process, Quality and Safety: Frameworks and Challenges.- Mathematical Modeling of Transport Phenomena for Simulation and Optimization of Food Processing Operations.- Food Preservation Process Design.- Advanced Sensors, Quality Attributes and Modeling in Food Process Control. Part V. Modeling and Control of Food Safety and Quality.- Predictive Modelling of Textural Quality of Almonds During Commercial Storage and Distribution.- Developing Next Generation Predictive Models: A Systems Biology Approach.- Dynamic Approach for Assessing Food Quality and Safety Characteristics: The Case of Processed Foods.- Hyperspectral Imaging Technology: A Non-Destructive Tool for Food Quality and Safety Evaluation and Inspection.- Food Chain Safety Management Systems: The Impact of Good Practices. Part VI. Current and Future Issues.- Does Biofuel Production Threaten Fodo Security?.- Academia-Industry Innovation Interaction: Paradigm Shifts and Avenues for the Future.